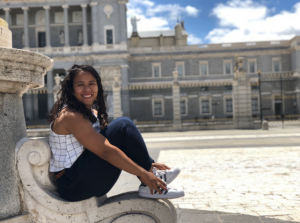 Aliyah Patricia Cruz (c/o 2022) started her journey at the Eshelman School of Pharmacy a month ago. Born at a military base in Japan, she grew up in the small military town of Havelock-Cherry Point, NC. She used to play soccer her entire life until she started college at UNC Chapel Hill, where she picked up rugby and captained a team that qualified for national tournaments each year; super fun fact – one of her former teammates is now on the United States National Rugby Team! Sit with Senate’s Clara Kim interviewed one of our newest ESOP “Pharmily” members for a student spotlight feature. Sit with Senate: What motivated you to pursue pharmacy? Why Eshelman School of Pharmacy? Aliyah Cruz: I have known that I have wanted to be involved in pharmacy since high school! I started volunteering in the pharmacy in my hometown and it showed me how vital it is to understand the human body and how little pills can have a big impact. UNC ESoP really interested me not only because it was close to home, but also because it had all the aspects I was looking for: diverse community surroundings, public health options like the dual degree program, and an emphasis on interdisciplinary efforts! SwS: What are your stress management strategies? AC: Since it seems like I am constantly moving, my biggest relaxer is being able to sit down and just listen to music to chill out. I also am a huge proponent of moving around and exercising in some fashion, since it always makes me feel more relaxed and is a good way of wasting time! SwS: Where is your favorite restaurant/food/cafe in Chapel Hill? AC: I love Linda’s for the Sweet Potato Loaded Tots and Brussel Sprouts when hanging out with friends. SwS: Is there one thing you wish you knew before starting bridging course? AC: To calm down! I was, and still am, really excited to join organizations and take pharmacy classes, but being able to refresh my knowledge on some subjects and get to know my peers in the Bridging Course has been vital for me. SwS: Who is your role model? AC: My mother for sure (love you Papi). She has shown me how to overcome any obstacles that come your way with a smile on your face! AC: Bettering myself as a person, whether that means as a friend, as a cook, or just in the skills that I want to be better at. SwS: What are you looking forward to in the next few months? AC: I have a lot of little trips planned this year! I just took a weekend trip to see my family in Orlando, FL. I plan on seeing my old suitemate in Dallas during Fall Break, and I am going to Ecuador with my family in December. AC: A DJ. I think it could still happen.